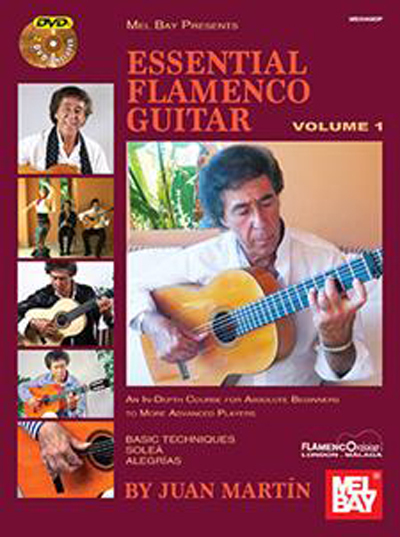 This book and accompanying video provide a thorough introduction to flamenco guitar. What are the essential elements and techniques of flamenco guitar playing? How does one capture the real essence of authentic flamenco guitar? These are questions that Juan Martin, celebrated virtuoso flamenco guitarist and teacher, addresses in this first book of a projected three-volume series. The method is designed for the complete beginner and requires no prior knowledge of the guitar or flamenco music. It also provides invaluable insight and material for more advanced players who want to capture the essential sounds, rhythms and emotional power of true flamenco.The series begins with in-depth demonstrations of how the basic building blocks of flamenco guitar technique are used in actual flamenco music. The material then progresses to a detailed exploration of the individual rhythmic forms - the palos. In this book, the fundamental palos of Solea and Alegrias are presented to emphasize the basic rhythms and provide examples of falsetas - the melodic passages. Martin then shows how to apply these when collaborating with a dancer and singer. The music is transcribed in standard notation and tablature (cifra), and the two DVDs contain over 3.5 combined hours of explanation and demonstrations. The first DVD provides a detailed introduction to basic techniques, using examples of authentic flamenco to show these techniques in action. The second DVD progresses to demonstrations of the Solea and Alegrias, including music for the soloist and the guitar accompanying the dancing and singing.